One of the most endeavored places for settlement in the globe, Australia has made numerous changes in its policies of immigration as it was the principal topic of Australian Prime Minister political discussion who also gave away implications of the immigration getting reduced at some states of Australia on one hand while giving employment facility on the opposite. 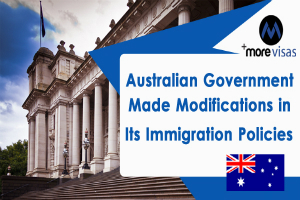 Below are the noticed modifications in Policies of Immigration by Australian Government. · The aim is on the Australian regional immigration, in which David Coleman, the immigration officer stressed the immigration in the essential states higher than other things. · He added that the Australian government is running on enhancing the immigration program to suit the requirements of specific locations which in turn has started pathways of the immigrants with restricted English and standard skills. · It concentrated on providing services or in better words giving security to the immigrants from their sponsors in the situation of families and old individuals. The meeting also discussed simplifying out rules for parents who are coming to meet their children lived in Australia, which will allow a temporary visa to be granted for a tenure of 3 to 5 years upon a fee of 5000 to 10000 AUD respectively. The sponsoring children will have to make assured that the parents have health insurance and do not provoke any healthcare debt. Families moving with partner visas are presently needed to go by a two-step verification, in which the spouse would be entered before providing them with the sponsored visa. This way they can assure that the sponsors do not irritate the immigrants and be supported in every proper way. Extra relief came in the business area where it could no longer be needed for the people to present their capital outlay to obtain the business visas which was the case before. This development is being made to enhance the economic sector of the South Australian weak areas.